Four million asthma patients are at risk of life-threatening asthma attacks this winter, Asthma UK said. 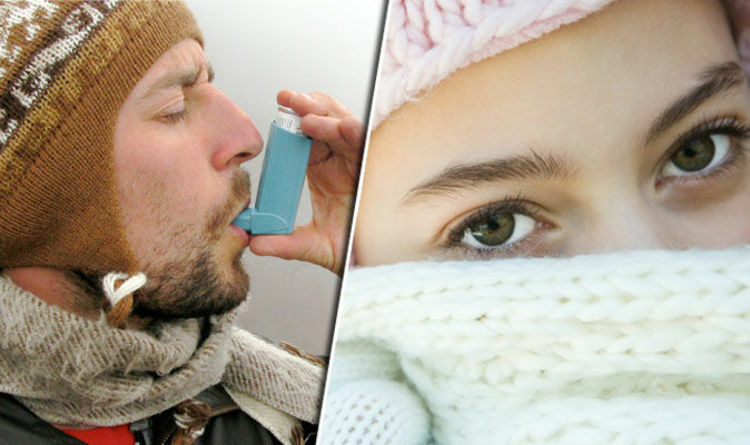 Three quarter of asthma sufferers reported symptoms getting worse in colder temperatures. Cold air can make the airways go into spasm, triggering a lethal asthma attack, they charity added. But, wearing a scarf across the nose and mouth would warm the air before breathing it in. This would reduce the risk of suffering an asthma attack, it claimed. Asthma UK Clinical Lead, Dr Andy Whittamore, said: “Most people aren’t keen on the nights drawing in and weather getting colder, but for many people with asthma, just going outside on a cold day can be life-threatening. “Living in the UK means that cold weather is impossible to avoid over winter, but if people have asthma, simply wrapping a scarf around their nose and mouth can warm up the air before they breathe it in, reducing their risk of having an asthma attack. The charity has launched its third annual #Scarfie campaign, in a bid to raise awareness of the simple way to lower the risk of asthma attacks. The #Scarfie campaign involves taking a selfie, while wrapped up in scarf, and posting it on social media. It’s supported by This Morning’s Dr Ranj Singh, as well as Stephen Fry, and Olympic athlete Jo Pavey. The campaign has helped numerous asthma patients to discover the best way to manage their symptoms during winter time, Asthma UK said, including Debbi Wood. Wood, 58, was rushed to A&E countless times, after her asthma symptoms flared up because of the cold air. “I’ve had asthma for nearly 30 years, but you never get used to the feeling of having an asthma attack,” said Wood. “It’s terrifying and feels like breathing through a tiny straw. “Cold air has been such a problem for me, and even walking the distance between my house and my car in the early mornings would trigger asthma attacks so bad I would have to go to hospital. “Thankfully, I saw #Scarfie on social media a couple of years ago, and now I have far fewer problems with my asthma in the cold weather. Someone has an asthma attack in the UK every 10 seconds, according to Asthma UK. Symptoms of an attack include coughing, wheezing, feeling tight-chested, and gasping for air.